With a track record of providing outstanding music talent for corporate events for over 15 years, Soca Jukebox is one of the top band choices for national corporate entertainment! Soca Jukebox is interactive with your audience and appeals to all ages and musical tastes. Their crowd-pleasing unique blend of Island-Rock covers everything - classic hits in Rock, Reggae, Country, Calypso and Soca (“SO-ul CAlypso”) infused with charisma, humor, false bravado and Rasta-goodness. This five-piece ensemble features a battery of shimmering steel pans, an array of Latin percussion, a fastidious rhythm section and incendiary guitar work. It’s a musical getaway that is uplifting and entertaining, a perfect fit for your corporate event. Soca Jukebox is available for, Client/Employee Banquets, Incentive Programs, Holiday Parties, New Year’s Eve events, Annual Galas, Product launches, Community Concerts, Festivals and so much more! Soca Jukebox comes complete with full back-line, lighting, and a pro sound company for your corporate event, and is available to travel anywhere! From their Kansas City, Missouri home base, the ensemble is a nationally touring corporate entertainment group that travels coast to coast. As a versatile guitarist, Jason Riley’s professional experience includes recording, composing, teaching and performing in multiple styles. His education in classical guitar and commercial music included extended study in American styles, the Jazz idiom and improvisation. Riley’s uniquely personal playing style, an improvisation-based approach utilizing “live” looping and tongue-in-cheek technical and technological effects, is demonstrated through his humble stage presence, acclaimed work with acoustic and electric instruments and heart-felt tributes to his many musical influences. His versatility of style, mood and character is seemingly unlimited: he can play soft and subtle, frantic and aggressive, he can swing, he can rock, he can play unaccompanied, with other guitarists or with symphony orchestra. His work on stage not only reflects his understanding of classical form and balance, but shows a highly original combination of this classical/rock/jazz background that very few guitarists can successfully execute in live performance. Jason has won competitions and reader’s polls in both the rock and country genres and has opened for and performed with national and international artists. He has also made numerous radio and television appearances. When not on tour, Jason serves as adjunct professor of guitar at Benedictine College in Atchison, KS and Missouri Western State College in St. Joseph, MO. He has also served as co-director at the Festival Chartres – an international guitar festival in Chartres, France. Imagine, if you will, a curly, ginger-haired 8-year old boy skirting the edges of the stages of dance halls and honky tonks throughout the wilds of north Missouri. His dad hands him the mic, and he throws down some Oak Ridge Boys and The Auctioneer Song, basks in the glow of the hot lights, then returns to his all-night Dr. Pepper bender. Everyone has to start somewhere, and that’s where Clay got bit by the rockstar bug. Perhaps he’s best described as some sort of modern-day superhero; living by day as his alter-ego business professor, small business owner, and mild-mannered family man. Then, when he hears a cry for rock, he always seems to disappear, and in his place swoops in the colorful character we’ve all grown to know. With the super-human powers of social awkwardness, toasting, Spanglish, and tenor crooning, he’ll save the day and send evildoers packing with a devastating booty shaking. Whether you need to sign up for a marketing class at Benedictine College, brew your own beer at Brew Lab (www.brewlabkc.com), or just want to laugh, sigh and cringe at some of the world’s most adorable, talented, and energetic kids, Clay will be there. He may not be the hero you need, or the one you deserve, but he’s the one you’ve got. JayPan is the confirmed and pre-qualified Hype Man for Soca J. Beyond that, he’s a multi-instrumentalist and backing vocalist specializing in Lead Pan, timbales, “more cowbell”, woodblocks and sundry percussion. He was Soca’s MVP in the 2005, 2008, 2010, 2011 and is a shoe-in this season. Jay is a considerate professional, consumate performer, dedicated family man and a true friend. Ben is the bassist, conservative watch-dog and accountant for Soca J. He performs many other honorary duties for the band and is licensed to hunt cougar in 9 states. He holds the U.S. digital speed record for 2 fingers on his right hand and has been nominated and awarded the “Golden Jukebox” 5 years running. What to say about Ben…..Ben is a peculiar fellow, though quite brilliant actually. He has the ability to sit in a chair all day and think of a million great things to do, without actually doing them! Ben has lived a life that… Well he has managed to live a life that…. Well he’s alive. Just the other day, a long time ago, somebody was actually overheard saying something about how Ben isn’t as awful as one might think. In fact, he is even regarded in some circles as the King of the Spreadsheets. As Ben’s mad Excel skillzz tend to isolate him, he is always reluctant to reveal the true nature of his superpower. And so, he is a puzzle to the ordinary run of man. Yet, women are drawn to him because his powers are so fascinating. But Lo, there is no woman who can hold him! For always is he confronted with data of various types and values, and he must organize them into rows and columns. Will Ben ever find love?!? Experts believe it is highly doubtful. Outside of his commemorative spoon collection, Ben finds meaning and purpose while laying down crunchy bass grooves in the band he owns, Soca Jukebox. 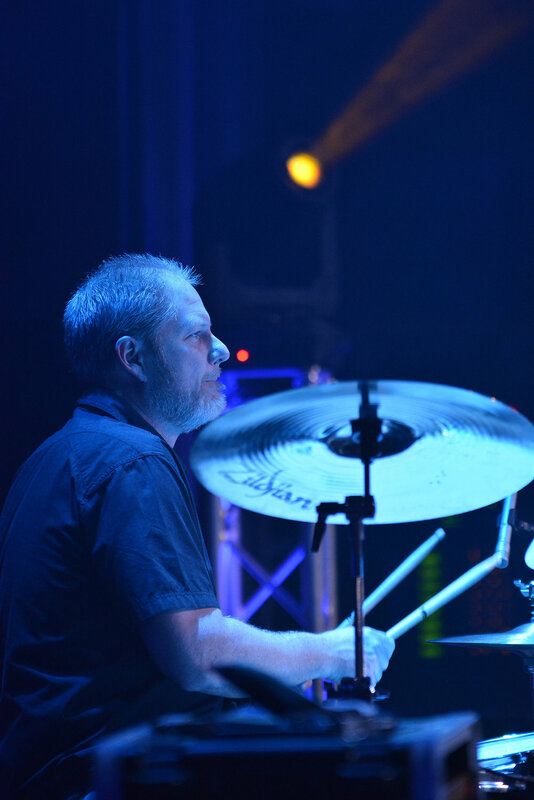 David Jarman (Dave) has been playing drums for over 25 years and is well respected in the local music community as a teacher and session drummer, as well as for his ability to rock out with the best of them. As soon as Dave sits down at the drums and picks up his sticks, his versatility and talent are evident; his passion for music is unmistakable. Drumming became an important part of Dave’s life at an early age and has been a constant ever since. He has performed as a freelance drummer with countless ensembles and has tracked drums on many albums. In his spare time, Dave enjoys building custom drum sets (Jarman Drums), woodworking, and mountain biking. How Soca Jukebox makes audiences (and promoters) happy! We entertain people. They have fun. Music lifts people up. We all can get a little down sometimes. Those cloudy and cold, January, Missouri days can be brutal. That's when we've got to get together and "feel alright". Audiences of all kinds... our friends, our family, your guests, your clients, festival go-ers, entertainment seekers and just plain music-lovers seek the benefits of music and music lessons.